ifm begins construction - WSSE "INVEST-PARK". Wałbrzyska Specjalna Strefa Ekonomiczna "INVEST-PARK". 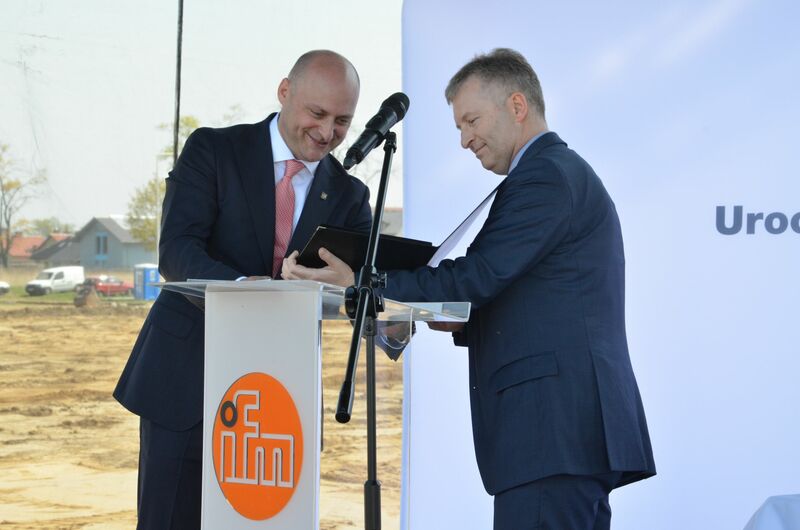 Around 100 engineers will be employed at the R&D center that is being built by ifm ecolink in Opole. “It is one of those rare cases when a German company invests in technology development in Poland,” the company’s president Andrzej Durdyn said. The center will be built near ifm ecolink’s plant in the Wałbrzych Special Economic Zone in Opole. The facility in Opole is part of the ifm electronic corporation, which specializes in producing industrial automation elements. The company has branches in more than 70 countries all over the world. Three years ago, a factory making electronic sensors was built in Opole, and now the company has decided to make another investment in the Wałbrzych zone. “The construction of an R&D center has always been my dream, and it is the crowning achievement of my work. It will enable us to develop our products and employ specialists from the region,” Mr. Durdyń said during the ceremony of laying the cornerstone. The facility with a surface area of ca. 4,000 square meters will be equipped with state-of-the-art laboratory apparatus. Around 100 engineers, mostly from Opole University of Technology, will ultimately work here on developing innovative technologies and patents. The university has already begun cooperation with the firm. “The company is treating us very seriously,” Prof. Marek Tukiendorf, Rector of Opole University of Technology, emphasizes. “Our lecturers have even visited the company seat in Germany, where they were acquainted with the technological solutions used by ifm electronic, the parent company,” he adds. A time capsule was buried during the ceremony of inaugurating the construction. The metal tube contained the founding act, a photograph of the facility employees, parts produced at the facility, and the current issue of a local newspaper. The construction is scheduled to finish by the end of this year. The Wałbrzych Special Economic Zone has more than 40 ha of land available to investors in Opole.